Multiple, Intense, Abrupt Late Pleistocene Warming And Cooling: Implications For Understanding The Cause Of Global Climate Change | Watts Up With That? The results of oxygen isotope measurements from ice cores in the Greenland and Antarctic ice sheets several decades ago stunned the scientific world. Among the surprises from the cores was the recognition of multiple, late Pleistocene, extraordinarily abrupt, intense periods of warming and cooling. The most precise records of late Pleistocene climate changes are the ice cores of the Greenland Ice Sheet Project (GISP) and the Greenland Ice Core Project (GRIP). These cores are especially important because the ages of the ice at various levels in the core have been measured by counting annual layers in the ice, giving a very accurate chronology of climatic fluctuations determined by measurement of annual layers. Figure 1 is the oxygen isotope record from the GISP2 Greenland ice core from 11,000 to 15,000 years before present (BP). Although it is not a direct measure of temperature, the 18O/16O ratio is a proxy for temperature. Figure 2 is the reconstructed temperature record for the same time interval, based on data from Cuffy and Clow (1997), modified by Alley (2000). Comparison of the two different approaches in Figures 1 and 2 shows essential agreement. The temperature variations shown in Figures 1, 2, and 3 correlate very well with other geologic data that has led to recognition of several named periods of warming and cooling. The named periods of warming and cooling discussed below were established long before the same climatic events were discovered in the ice cores. Bølling warm period: Abrupt, intense warming 14,500 years ago resulted in sudden wholesale melting of the huge continental ice sheets that occupied vast areas in North America, Europe, and Russia and extensive alpine glaciers in mountainous areas. What made this warming so remarkable was not only its abrupt onset, but also its intensity. Temperatures in Greenland rose 20°F (~12° C), about equal to the total cooling of the late Pleistocene glaciation, to near present-day levels in about one century (Figs. 1, 2). Although this temperature change is for Greenland, simultaneous glacial retreat all over the world indicates that this was a global event. Prior to the ice core analyses, such large swings in temperature were believed to have taken a thousand years or more. This warming event, known as the Bølling (Figs. 1, 2) lasted only a few hundred years, but temperatures rose to near-modern levels. Older Dryas cold period: At the end of Bølling, temperatures suddenly plummeted about 20° F (~11°C) from the Bølling maximum in a few hundred years (Figs. 1, 2), initiating the Older Dryas cold period, which lasted from about 14,300 to 14,000 years before present (BP). Temperatures returned to near full glacial levels and glaciers halted their rapid retreat. Allerød warm period: About 14,000 years BP, temperatures once again rose abruptly and the Allerød warm period began. It lasted until 12,800 years BP, but was not as warm as the present or the Bølling. However, the rate of warming was very intense ~8° F (~4.5°C) accomplished in as little as a single century. Inter-Allerød cold period: Near the end of the Allerød warm period (13-14,000 years BP), temperatures dropped precipitously, ~14° F (~8°C) in about a century (Figs. 1, 2) during a time known as the Inter-Allerød cold period (IACP). Temperatures returned to near full Ice Age levels but persisted for only a few hundred years, so glaciers halted their retreat but did not rebuild to former extents. Just as suddenly as it had cooled, the IACP warmed abruptly 9° F (~5°C) and temperatures returned to Allerød levels. Radiocarbon and isotope dating of glacial moraines in regions all over the world and abrupt changes in oxygen isotope ratios in Greenland and Antarctic ice cores indicate that the Younger Dryas cooling was globally synchronous. Evidence of Younger Dryas advance of continental ice sheets is reported from the Scandinavian ice sheet, the North American Laurentide and Cordilleran ice sheets, and the Russian ice sheet. Alpine and ice cap glaciers also advanced during Younger Dryas cooling in both the Northern and Southern hemispheres, e.g., many places in the Rocky Mts. of the U.S. and Canada, the Cascade Mts. of Washington, the European Alps, the Southern Alps of New Zealand, and the Patagonian Andes Mts. of South America. 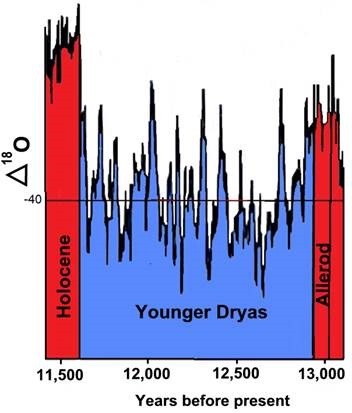 The Younger Dryas cooling was not just a single climatic event. Climatic warming and cooling occurred not only before and after the YD, but significant climate fluctuations also occurred within the YD. That these were global events that occurred in both hemispheres is shown not only by the ice cores of Greenland and Antarctica, but also in glacial deposits of the major, late Pleistocene ice sheets of the world, all of which experienced multiple moraine-building episodes as did alpine glaciers. Figure 3 shows a plot of oxygen isotope variation within the YD. Temperatures fluctuated up and down at least a dozen times, some brief warming periods reaching near-Allerød levels. That these climatic fluctuations were real and global in extent is shown by multiple YD and IACP moraines in the Puget Lowland of Washington, Loch Lomond in the Scottish Highlands, European Alps, Rocky Mts., Alaska, Cascade Range, Andes, New Zealand Alps, and elsewhere. How do past temperature oscillations compare with recent global warming (1978-1998) or with warming periods over the past millennia? The answer to the question of magnitude and rates of climate change can be found in the δ18O and ice core temperature data (http://wattsupwiththat.com/2011/01/24/easterbrook-on-the-magnitude-of-greenland-gisp2-ice-core-data/). We can compare the warming and cooling in the past century to approximate 100 year periods in the past 25,000 years (Fig. 4). Not all of the periods noted here are exactly 100 years̶̶—some are slightly more, some are slightly less, but they are close enough to allow comparison of magnitude and rates with the past century. The multiple nature of YD moraines in widely separated areas of the world and in both hemispheres indicates that the YD consisted of more than a single climatic event and these occurred virtually simultaneously worldwide. Ice sheets and alpine glaciers were sensitive to the multiple YD phases. (1) The ice core isotope data were hugely significant because they showed that the Younger Dryas, as well as the other late Pleistocene warming and cooling events, could not possibly be caused by human emissions of CO2 because they occurred thousands of years before such emissions had any effect on atmospheric CO2. (2) The magnitude and intensity of multiple climatic fluctuations has been up to 20 times larger than warming during the past century. (3) Single events, i.e., volcanic activity or cosmic impacts, cannot have caused the abrupt Dansgaard/Oerscher warming and cooling events because of the multiplicity of warm/cold events over periods of thousands of years. (4) The absence of a time lag between the N and S Hemisphere glacial fluctuations precludes an oceanic cause and is not consistent with the North Atlantic Deep Ocean Water hypothesis for the cause of the Younger Dryas. (5) The abruptness of the climate changes and their multiplicity could not have been caused by slow, Croll-Milankovitch orbital forcing, which occurs over many tens of thousands of years. Since fluctuations to and from full glacial climates occurred over short periods of time, clearly a cause other than the Croll-Milankovitch theory is capable of causing the Ice Ages . To anyone with an open mind, these data would be dispositive. 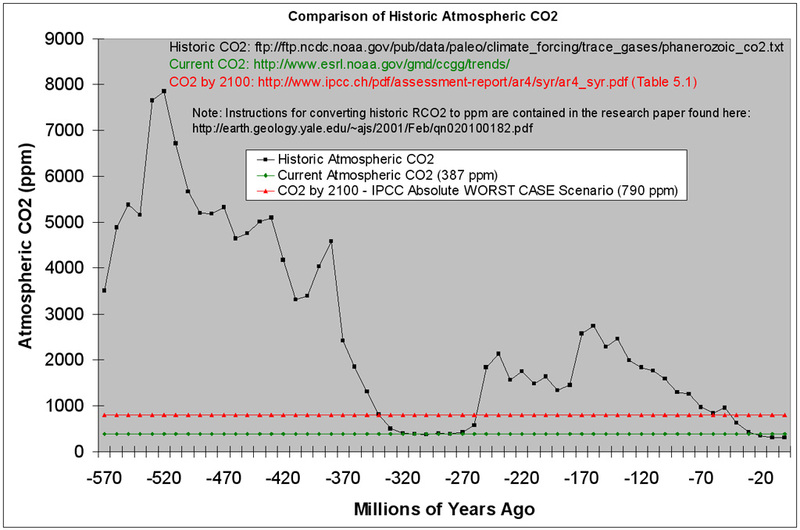 The effect of CO2 is negligible, and at least so far during recent decades, beneficial. I’m thinkin’ that if you correct the spelling in the title folks might take the article a little more seriously. Yet, even today, there are articles in USA Today referencing climate change due to “heat-trapping” CO2. I can only shake my head with wonder. Mother Nature is beautiful and wonderful, but I hope everyone keeps a key fact in mind: she has a nasty temper. Could we see these temperature proxies compared with Be-10 in the ice cores over the same period? It just goes to demonstrate what we know about what makes our planet’s climate tick is only a tiny fraction of what we do not know. This is why non-government geologists are the most sceptical group on the planet. Geologists know that climate change is natural and normal and there is not a thing we can do about it. This is the greatest fear of the Global Warming Industry that people come to realise that climate change is all about natural cycles and has little or nothing to do with the levels of the supposedly evil gas carbon dioxide. There are ‘tipping points’ in the Earth’s climate as the post clearly illustrates and with our current level of knowledge, we can only make an educated guess as to why they happen. This post will be considered as a great heresy by followers of the Global Warming cult, as it clearly illustrates the crass stupidity of their beliefs and the irrelevance of their deeply flawed computer models. What scares me is it suggests the current inter-glacial cycle started longer ago than I originally thought. That means the next ice age is just that much closer. You just can’t mess with natural climate cycles. The oxygen isotope data shows clearly that temperature variations occurred with a frequency on the order of decades, not centuries. This is far too fast for astronomical influences, but not too fast for oceanic current pattern shifts (PDO, AMO, NAO, or ENSO). There are multiple oceanic patterns which seems to shift independently, but which contribute to global climate simultaneously. The patterns are also far too regular in period to be purely stochastic as would be expected from cosmic rays or material bombardments. The CO2 is just a smoke screen. The real climate drivers are the heterogeneous but fluid thermal ballast masses in the ocean basins. The next time someone mentions “unprecedented warming”, enthusiastically hit them about the head and shoulders with some Bølling . tadchem: Too fast for astronomical influences? Not too fast for GCR, or solar UV changes, both of which have been linked to climate. This data should be incredibly troubling to climatologists everywhere, because it makes it very difficult to describe any rational cause to the fluctuations — but one. If the Earth is a near-critical multistable nonlinear system with attractors scattered all over the place in phase space, that would just about do it. Various parameters such as CO_2 and aerosols might well modulate the landscape on which the poincare cycling occurs, causing attractors to appear and disappear, but the data looks just like what one would expect from a system with near-critical feedback being driven by random noise, so that “insignificant” noise events (butterfly wings) can cause actual CLIMATE shifts in fifty or a hundred years. Or the butterfly can flap its wings differently and things appear, for a moment or two, stable. Well, maybe two. The one variable whose past behavior we cannot speak to with any degree of confidence is the Sun. Orbits are predictable. Precession is predictable. At the moment, however, we cannot predict the sun from one cycle to the next with any great deal of confidence, certainly not for two or three cycles out. We have sparse data here, but the LIA suggests that a century long pause in solar activity is perfectly capable of causing a rapid plunge in global temperatures (to the lowest in the entire Holocene). Similarly, the increase of solar activity to “normal” or even high levels seems correlated with the recent post Dalton warming. The pause in “even” CO_2 linked warming could be connected with the notable drop in solar activity, possibly presaging another Maunder or Dalton type solar minimum. We cannot rule out “mere” solar variability as being 100% of the cause of the major variations in the curves above, if the Sun varies from its active to inactive phases with a timescale on the order of a few hundred to a few thousand years, and with a fairly random/noisy variation in cycle strength in between. Neither, of course, can we explain it — we have no reliable data, no verified theory of solar state, no verified theory of how solar state might impact global climate at the proposed level. There is plenty of science remaining to be done here. It is fortunate that at least a few people are willing to do it even though the results are likely to be as welcome to the worshippers of human caused climate disaster as Galileo’s results were to the then-Catholic church. Ice ages scare me a lot more than warm periods. Just as we are now beginning to plan to avert asteroid hits on earth it seems that we should be giving some thought to engineering projects that can stop the planetary threat of an ice age. They would be huge, of course, and CO2 alone doesn’t pack enough of a punch. You should print that comment out and nail it to the front door of the National Academy of Sciences. Of the conclusions, number 3 is not necessarily correct about impacts, since it assumes that there could only have been one impact event. Current thinking on the YD impact hypothesis leaves the possibility of more than one at the YD onset. Some in the wider community are considering that, with the nature of the Taurid meteor stream, it is possible that impacts may have occurred repeatedly during the YD. Such events – though barely conceivable (and certainly not conceivable within the current geological Gradualism meme) – could conceivably have also occurred late in the Pleistocene. This is all quite speculative at the moment. None of this means CO2 has no warming effect. It just says that it is not the only thing affecting climate. Whether our current era is mostly, moderately, or only slightly affected by CO2 as opposed to other factors is what needs to be determined. One other point. I went to Wikipedia to look at the Holocene temperature variations. 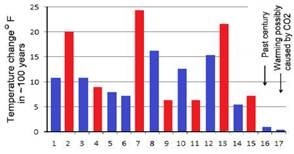 They have an interesting graph which shows multiple proxies that seem to be up and down but then an average that appears somewhat flat and stable. If this post is based on ice core proxies, it might be that drastic temperature changes would smooth out if multiple proxies were used. However, the reverse might also be the case – that the Holocene itself has had more variation than appears in the Wikipedia graph but when you average the good and bad proxies together you get something that looks to be more stable than it really is. When I started validating the assumptions of the ‘water’ isotopes of the ice cores, nothing made sense. Take for instance the mystery interval (Denton et al 2006), warming during the cooling. the abstract : “It’s not the heat, it’s the humidity. The isotope paleo thermometer of the ice cores is a proxy for absolute humidity and hence it cannot be used as an accurate reconstruction for paleo temperatures. Ref. Denton, G.H., Broecker, W.S., and Alley, R. B., 2006, The Mystery Interval 17.5 to 14.5 kyrs ago. Pages News 14, 14-16. I imagine Leif will be along any moment now. I think from observations of sun like stars in other solar systems we know that these stars have a somewhat predictable history and, although they vary in small cyclic ways, they do not turn on and off in drastic ways. Dr. Easterbrooks information ought be dispositive on the very large role of natural variability compared to AGW. But it obviously isn’t because most of the information has been available yet AR5 SOD does not substantially modify AR4 conclusions. Similarly the MWP and LIA should be dispositive on shorter time frames. They haven’t been because of the efforts of folks like Mann and Marcott to essentially disappear them through various statistical manipulations, including the graphical representations in AR3 and AR4. Hardening up the realities of natural variation could be one of the most effective counterpoints to AGW, given the increasingly obvious failings of the models and the IPCC to predict this century’s temps. A simple two part graphical explanation for the uninitiated: models wrong, climate variation normal. Thanks. Beautiful post and easy to understand. Does variation by a factor of two in higher energy solar spectra v. lower energy within a not that variable TST count as drastic? How about the variation in solar magnetic flux? Drastic or not? IMO it doesn’t take much variation in solar radiation & magnetism to effect big swings in Earth’s climate. Younger Dryas, as well as the other late Pleistocene warming and cooling events, could not possibly be caused by human emissions of CO2. I’m not sure about the making of this statement. I don’t think it’s necessary. Dr Brown, many thanks for all your post and this one in particular. You clarity and precision is a great example to the idiots that pervade the world of climate theology. It look like TSI for sun like stars doesn’t really change that much unless we are talking about millions of years. I haven’t given up that there is some solar influence but I think there needs to be some major augmentation mechanism. I think rgbatduke is closer to be on the right track with “near-critical multistable nonlinear system with attractors scattered all over the place in phase space”. About 14,000 years BP, temperatures once again rose abruptly and the Allerød warm period began… However, the rate of warming was very intense ~8° F (~4.5°C) accomplished in as little as a single century. Compare that 4.5ºC warming over a single century with the extremely mild, 0.8ºC fluctuation over the past century and a half [and which climate alarmists are incessantly arm-waving about]. In reality, the current climate fluctuation is a non-event. We have truly been living in a “Goldilocks” climate during the past 150 years: not too cold, not too hot — but just right. And, when observed on a normal chart measured in degrees [rather than in tenths or hundredths of a degree], the minor temperature fluctuations are imperceptible. Natural variability can abruptly change global temperatures by fully tens of degrees, over just a few decades. That has occurred regularly, and during times when CO2 levels were much lower than now — which deconstructs the CO2=AGW conjecture. There is a good reason why geologists in particular tend to reject CO2 as the failed cause of recent, very minor global warming: geologists know that the planet has routinely experienced very large temperature fluctuations during times when CO2 was very low. Until recently, the biosphere was starved of harmless, beneficial CO2. Kudos for this excellent article, which puts the current very minuscule temperature fluctuations into a geologic perspective. As complete ignorant of the ice core science, maybe the question is stupid, have these annual layers been confirmed by a different measurement? How sure is that the layer represent 1 year? The Sun was long thought to be a invariable star, with its total energy output constant. However, satellite measurements over the last 20 years have shown that it does vary. There is a 27 day variation in solar output due to its rotation and the presence of dark sunspots and light areas of faculae (this makes it an extrinsic variable). There is also a longer (~11 year) variation coincident with the sunspot cycle. The average periodic change in solar luminosity over a decade is about 0.1 %. Short term variations, due to the appearance of sunspots, may be on the order of a few times 0.1%. The Sun has also been found to vibrate or oscillate with a period of around 5 minutes (this makes it an intrinsic variable). The brightness variations due to this vibration are very small. In the 1970’s John Eddy collected evidence that shows that the solar variations have not been constant over timescales of centuries. In particular, the solar 11 year variation seems to have been absent in the latter half of the 17th century (1650 – 1700). The speculation is that it may also have been stronger at other times in history. 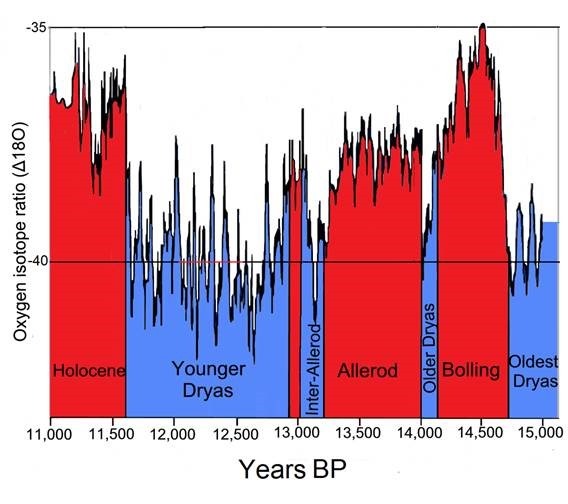 Wouldn’t you think that the sharp temp rise at the end of the Younger Dryas should have been a clue to the fact that the Earth can warm at a rapid rate all on it’s own? But what it means is that there is now no support for the argument that anthropogenic CO2 is the ONLY possible reason for the unprecedented rise in temperature 1980 – 1998 as the change in temperatures is not unprecedented. And the preceding changes in temperatures exceeded the twenty years at the end of the twentieth century in size and rate and were not linked to anthropogenic CO2 emissions. Therefore to apportion current atmospheric global warming causality to anthropogenic CO2 there needs to be empirical evidence of a real world atmospheric temperature rise caused by anthropogenic CO2. There is no such evidence. Indeed as the temperatures have remained flat for more than 15 years there is significant evidence to falsify the hypothesis that anthropogenic emissions of CO2 cause global warming. Its interesting that the upper paleolithic Magdalenian culture managed to survive with all of this climatic variation. Not only did this culture survive, but these people managed to find the time to produce some wonderful pieces of art. Greenland-Scotland ridge where the warm Atlantic and cold Arctic currents meet in narrow passages. The most critical is Denmark Strait which is bottleneck on the superhighway in the oceans global circulation (WHOI). Denmark Strait is only 600m deep but it has 800m depth of sediments, mostly of volcanic origin. Although the Island’s active volcanoes number just over 1% of the world’s total, it is estimated that they produced more then 30% of the total lava eruption. Denmark Strait’s deep cold current (North Icelandic Jet) is a key component of the Atlantic Meridional Overturning Circulation (AMOC), also known as the “great ocean conveyor belt,” which is critically important for regulating Earth’s climate. I largely agree there is evidence that CO2 is not the only possible reason. The fifteen year flatness does indicate that there is more affecting climate than CO2 but it doesn’t prove CO2 has no effect either. I wonder what would constitute evidence for you. Regarding the sun again, I would hope Leif would put in an appearance. My statement was that TSI does not change much in decadal cycles. Apparently it hasn’t change much since the Maunder minimum either. So I think you need an argumentation mechanism if it is have a larger climatic effect. We can speculate that TSI might decrease or increase more dramatically in the future or maybe has done so in the past but I haven’t seen any evidence of that on hundreds or thousand year time scale. If you have some evidence, please point it out. Maybe it’s the solar wind cutting in and out. Here are responses to some of the comments above. The Maunder, Dalton, 1890-1915, and 1945-1977 cold periods all show 10Be spikes, indicating increased 10Be production (i.e., increased cosmic radiation), which reinforces the Svensmark hypothesis. “I said ‘cosmic impacts,’ not ‘astronomical influences.’ A good argument can be made for solar changes. The number of warming/cooling events is about two dozen over just the period of 11,500 to 15,000 and there are many older ones going back 100,000 years. Where are the impact craters if these were caused by cosmic impacts? They are too young to be erased by erosion. which shows a lot of temperature changes during the Holocene, but not as profound as the late Pleistocene ones. And yes, if you add a lot of low precision proxies on a composite curve, they will dampen out the details and mask details of the climatic events. The problem with this concept is that the Greenland ice core 18O and temperature reconstructions (see figs 1 and 2) are nearly identical and both match global glacial advances and retreats. You can’t melt much ice by reducing the humidity. The annual layers are recognized by a greater accumulation of dust during the summer ablation period and these are seen from much greater electrical conductivity. They make a very regular pattern and if you add them up for any known climatic event, they match quite nicely. I think this analysis suggests that the mix of particles and wavelengths from the sun is far more variable than previously thought and linking that to my proposal that such variations alter the vertical temperature profile of the atmosphere provides a possible solution. By my proposal such changes alter the gradient of tropopause height between equator and poles so as to allow the climate zones and jets to shift latitudinally. That alters global cloudiness and albedo to change the amount of solar energy able to enter the oceans to fuel the climate system. It is clear that the temperature changes are tied to isotope changes that reflect solar behaviour so I commend my proposal for further research. Such a mechanism explains the thermal amplification of solar variations and detaches many of the observed temperature variations from the Milankovitch cycles. May I have some money and a suitable tenure please ? It’s enough to make multi-thousand-mile diameter solar reflectors look like a reasonable contingency plan. If the CAGW-Agenda 21 cabal(s) don’t hamstring and impoverish the globe as intended, a few decades or a century or so should make the option available. Clarification: ^^space-borne reflectors, of course. Before I retired from my position as a geology prof I often took my students on field trips out to the glacial deposits exposed in gravel pits west of Ann Arbor. In one very large pit (Killins gravel on Scio Church Road) the pit had a two layered aspect. At the bottom was the well washed sand and gravel that was deposited as the Erie Lobe of the Wisconsinian ice sheet had retreated and the meltwater pouring off the front of the ice laid down thick and economically valuable outwash material. Must have been a time of ice retreat and presumably warmer climate. At a later time the ice readvanced over the outwash gravel and laid down a thinner but very obvious layer of clayey glacial till. The climate must have cooled to get the ice to readvance and then the climate changed or stalled and the melting ice lobe dropped it’s load of till (everything from fine clay to crystalline Canadian boulders as big as a car) on top of the outwash deposits. It’s situations like this that always made be dubious of the notion that the climate could only change for the worse because of man’s actions. What could be more natural than climate change. You show me one glacial readvance or retreats, or other temperature proxies that matches the ice core isotope temperatures during the last glacial transition and I reply with three at a minimum, but maybe some ten or more that contradict them..
Data source, excell spreadsheet style? I’m interested in data density: although the dating may be by annual ice layers, the oxygen-18 and CO2 sampling will not be at that level. Also, CO2 levels are something like 70-year running averages, due to the ice “breathing” during pressure changes before the vertical permeability is at zero (for practical purposes, anyway). Whatever sampling has been done, trend analysis to get the curves as shown has used some other length of time for smoothing: is it two hundred years, or more? And what happens when you smooth a previously “smoothed” data record – what is the setback error you get on the start date of changes? As for oxygen-18 data: here the data is taken from the water, not the air. The oxygen isotope data is thus “of the moment”, not a 70-year running average. Still, data density is important, especially if it is not equal to that of CO2. The principal smoothing would simply be that appropriate to the data density. The more smoothing you get, the more “setback” you create in the time of trend change, i.e. you start a decline (or warming) on a graphical display BEFORE the initiating factor of that change. In modern records, you cause a temperature drop 18 months or so before the volcano erupted that caused the temperature drop. I wonder if this has caused at least some of the disconnect between the CO2 and the isotope-temperature trends in the ice-core data. The problem is dealing with sharp, threshold-type, acute events within a long-term pattern. The data “corrections” that are done should, but typically don’t, take this stop-start condition into account. Statistical breaks don’t work well for the mathematically inclined as they degrade what are supposed to be seen as “continuous” records that bear consistent manipulation or, in their worst fears, are neither continuous nor general: what you really can get from them is the time and events of that spot. Mannian logic doesn’t work that way. A reference to the digital data would be useful. How do they calculate the age of the ice? By counting the annual layers. How would they know how many layers it had lost. Maybe this might account for those sheer vertical drops on the graph? I followed your link to a 503 error. I am interested in the notion you propose, but cannot consider the work in question. I read about Taleb’s views on AGW, and his basic admonition is that it is a bad idea to perturb a chaotic complex system since you can’t possibly predict the downstream effects due to the system’s complex chaotic nature. So he agrees with us that the models are a joke. But he agrees with them on the “precautionary principle” even though for him it is based on the general principle of unpredictable result, and for the CAGWists it is based on their overconfidence in believing they have insight into what will happen. One question in this context would be — Is our contribution to CO2 enough of a perturbation to have any material downstream effect in the context of Rgbatduke’s near-critical multistable nonlinear system with attractors scattered all over the place in phase space? Thanks for any perspective the experts might have on this. Good try, but what is the dew point of air at -40 C? -30C? Nice charts, but drawing the lines doesn’t make them real. Below freezing, H2O molecules can aggregate on a surface without forming clouds first. Frozen fog can plate surfaces, but in the case of frozen fog, we can’t really discuss the relative humidity, just the absolute humidity and that’s not homogeneous – you see the ice crystals in the air give the AH function a stepwise look. Molecular aggregation is likely the source of the O18 in the ice, and claiming that the humidity was a variable is somewhat fanciful. As long as the molecules aggregated in the air, rather than directly on the surface, what is the change? Well, goodbye unprecedented rate hello pretty much normal. Now if we can just get the alarmists to acknowledge Henry’s Law maybe we won’t have to listen to the next fall back position. I thought it was called the Quaternary Ice Age and I thought it was ongoing, despite the Holocene Interglacial. Scientists of all disciplines can run controlled experiments in labs, and they can simulate responses on computer models, but if it does not, or has not happened out in nature, there’s no basis for saying any experimental or theoretical finding is real. Geology. The proving ground of all sciences. Has what have created/devised/deduced/theorized actually happened in nature? If not, then we are in the realm of technology – or fantasy. Thanks Dr. P. Always a treat. I’ve tried pointing people to these other events in the record like the Older Dryas, which I would say started at 14,300 years ago and is a bigger downturn than the Younger version. There are 28 of these swings in the Greenland ice core record over the last ice age, so there is nothing special about the Younger Dryas. It is a common feature in the Greenland ice cores and in the ice age climate record. (I think it is more just periods of when the glaciers were advancing and then retreating. There needs to be a very strong push of snow accumulation in the centre load points like the one over Hudson Bay to keep the ice age glaciers moving south. When this accumulation slows, the glaciers melt back because the Sun is just far too strong in Central North America in the summer for glaciers to exist, even in the lowest low points in the Milankovitch cycles). In any event, the climate can change all its own in very short time periods. If you throw the CO2 record from Antarctica over top, we see nothing but conflicting trends with CO2 rising and temperatures falling and visa versa. James Cross – There is a lot of evidence, including the halt in global warming observed from 1980 to 1996 for an almost equal period (and still counting) that carbon dioxide emissions from burning fossil fuels are not the root cause of global warming. The evidence that I find points to natural cycles as causing variations in earth’s climate, especially ENSO. For more than 20 years, especially the last 6 years, I have been looking for evidence that carbon dioxide is the root cause of global warming without finding any. Since you seem to believe that carbon dioxide is the root cause, could you please list some specific directly detailed citations that form the basis of your belief that carbon dioxide caused the observed recent global warming? The global warming discussion is not whether or not the climate has warmed the last 150 years nor the period from 1980 to 1996, but why did it warm? One cannot address corrective actions until one has first correctly identified the problem. Carbon dioxide may have some influence but perhaps not as much as the new water added to the atmosphere from producing fossil aquifers (no or slow to recharge) to irrigate food and fodder. This new water accounts for 2.6 mm per year of increase in ocean levels. Check out the temperatures in the graph, all less than -30°C / -22°F. What this shows is that climate is bistable and when slightly cooler than the climate we are now experiencing, can switch between ice age and non ice age conditions very rapidly displaying huge swings in temperature over a short period of time. We should therefore be wary of the possibility of catastrophic sudden cooling should the climate get much cooler than it is today. The climate however does not seem to be susceptible to instability in the other direction. We are unlikely to see sudden extreme warming from today’s temperatures. This analysis is qualitative not quantitative. However quantitative analysis is not always superior and can hide a multitude of sins. Those who compute a single sensitivity number for climate are misinterpreting the nature of climatic variation. Of the conclusions, number 3 is not necessarily correct about impacts, since it assumes that there could only have been one impact event. Current thinking on the YD impact hypothesis leaves the possibility of more than one at the YD onset. YD isn’t anything really special from all the other cooling events going into the Holocene, except it was the last one of them. More importantly, there is some evidence that YD-like events are not unique to this interglacial. You are technically correct, but the usage of the term “Pleistocene Ice Age” is still common. Some things just seem to get entrenched. Personally, I would like to see the Holocene – Pleistocene division disappear altogether, but that’s not about to happen. Don’t take that last comment to mean that I trivialize the extinction of your Smilodon relatives. Whenever there is a shift from one relatively short term ‘environmental paradigm’ to another i.e. a bistable system as Ian H said, there is almost invariably a period of enhanced instability where the parameter one is measuring goes through one, two or three large sin wave cycles before settling into the ‘new environmental paradigm’. Classic examples of this I have often seen are e.g. where flows out of groundwater-fed streams or regional water levels on boreholes reflect a transitioning from a extended drought or lengthy wet period to the reverse state (of the bistable system). It is at these times that the fundamental period of whatever drives such state changes is starkly revealed. All these data Don has presented seem to rule out almost every fundamental period (or suite of periods) other than those which are no longer than about 100 years. In this context it seems almost crass to say that, once again; it must be the Sun (stupid). regularly getting hosed down by Leif Svalgaard with his perennial cry that the data (no matter how recent and how well peer-reviewed) is simply no good and hence irrelevant (i.e. it doesn’t get the Svalgaard seal of approval). Clearly it is also irrelevant that Svalgaard’s cell phones have probably been using Glassman’s Fast Fourier Transform for years. Yet we continue to wonder….So what are we (or more precisely Svalgaard), missing here? Then by all means, please post verifiable, testable, replicable scientific evidence showing that CO2 has a measurable global warming effect. We already know, based on empirical observations, that ∆CO2 is a function of ∆T. But there is no testable evidence showing that ∆T is a function of ∆CO2. None at all. Any such claims are based on simple graphical overlays — which are not evidence of a cause-and-effect relationship. A simple overlay does not show which is the cause, and which is the effect. So far, all claims that CO2 causes subsequent changes in temperature are nothing more than circular arguments and hand-waving. But I could be wrong. If you think so, post your testable evidence here, showing conclusively that ∆CO2 causes ∆T. These abrupt change are some to think about, but they take place over generational periods. They do not happen over night. Oh, it could still go the way of the Brontosaurus. I consider all Holocene believers to be Quaternary deniers. Thanks for the kind words about my family. This data does not match our models. Where’s the Hockey stick? The data must be wrong. Please correct the data so that it fits our model output. Once we entering a cooling (glacial) period, the positive feedbacks that perpetuate it are fairly clear; albedo and ice elevation. What’s more of a mystery is how we get out of glacial periods. Looking at figure 1, it seems we start a cooling period and then warm again within 2 to 4 centuries. The MWP to LIA would seem to be the climate norm, and indicates the post LIA warming is also largely natural. There is some mechanism that operates on a century scale that causes regular warming periods. The sun is the obvious candidate, followed by a multi-century scale ocean oscillation. Other candidates, a cycle to volcanic eruptions, and a cycle of sea level falls, causing large scale fires in coastal swamps and bogs, melting ice through albedo changes. The Sun is shipping out more energy but Earths climate has gotten radical unstable/colder the last 27 million years. Earth is moving away from the Sun? Earth is gradually loosing atmosphere/insulation? I think I would go for the last one? Earths magnetic field is getting weaker, due age? The Sun is getting bigger. Or both? At present, the overall geomagnetic field is becoming weaker; the present strong deterioration corresponds to a 10–15% decline over the last 150 years and has accelerated in the past several years; geomagnetic intensity has declined almost continuously from a maximum 35% above the modern value achieved approximately 2,000 years ago. The rate of decrease and the current strength are within the normal range of variation, as shown by the record of past magnetic fields recorded in rocks (figure on right). Great analysis. Another consideration is the constant changing star we call the “Sun” – episodes of violent sun storms has also affect Earth. One day, in the extremely far distance, our star will become like what all stars end up – a “Black Hole”. Hopefully, for the future of humans, there will be colonies amongst the stars where humans can move to a fresh place in the universe. It could happen sooner if we would stop fighting amongst ourselves on this small blue planet – and look to the stars. But in reality of human nature, there will always be someone or some group that wants the real estate of others and to subjugate the people. Spending more money on science and technology and reaching out into the universe is far better a course than spending vast amounts of money on wars and governments who do not recognize natural laws, rights and liberties. Anyway, I said to give at least three examples (not in the working paper) which support the hypothesis that isotopes in precipitation record humidity rather than temperature. From the USA, and the Younger Dryas the oldest -pre-isotope- records I could find online is Dreimanis 1968. 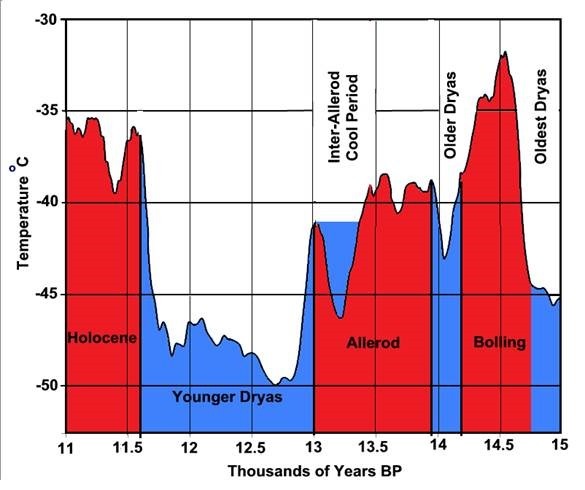 Note that the Younger Dryas in RadioCarbon dates or 14C dates is currently between about 10,010 and 10,850 BP using the INTCAL09 calibration table. Otherwise a great post, thanks Dr Easterbrook. Fig. 4 is a real eye-opener. Some of you will have seen the BBC Horizon program ‘Science Under Attack’. The program featured a senior NASA climate scientist. This scientist told an appalling and provable lie. He stated that mankind emits seven times more CO2 than Nature (in fact Nature emits around thirty times more than mankind). 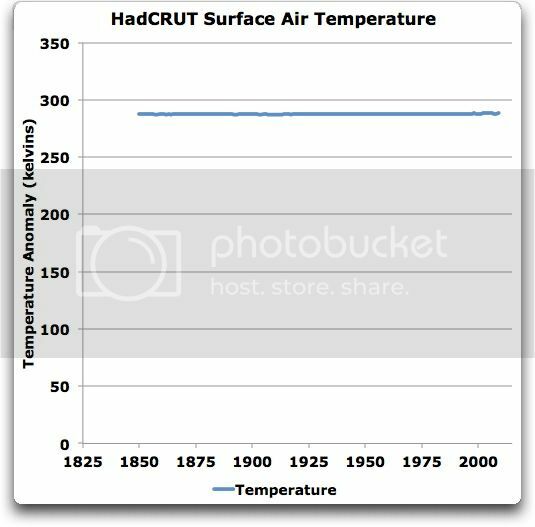 This ‘scientist’ told another lie: that, even if the 20th century temperature was not unprecedented, the rate of change certainly was. Looking at Fig. 4, it’s clear that he didn’t tell a lie. He told an outrageous lie. I hope this individual was disciplined for bringing NASA into disrepute. But I rather doubt it. These repeated steep rises and drops on a time scale of several decades – are they truly random, as the multiple-attractor hypothesis proposed by rgbatduke would lead one to expect, or do they follow some regular and possibly even familiar pattern, such as the sun spot cycle? Don’t forget that the drift and location of the continents plays a big part in setting up climate stability (or instability). They wouldn’t have to be random, just locally stable to a small perturbation but not to a larger one. That larger perturbation could be a random event or the result of a regular pattern. Great analysis by Dr. Easterbrook, as usual. AAPG Studies in Geology 47: Geological Perspectives of Global Climate Change, Chapter 11 – The Search for Patterns in Ice-Core Temperature Curves , by Davis, John C.; Bohling, Geoffrey C., p. 213-229. Note the peaks at 155 and 164 years on the Davis & Bohling power spectrum plots of the GISP2 ice core. Greenland and the rest of the Arctic are at or near the peaks of at least 3 different natural climate cycles (~60-, ~150- and ~1,000-yr). The Arctic is at about its peak Holocene cyclical warmth; yet it’s still not as warm as most of the previous cyclical Holocene warming episodes. This is due to the underlying glacial-interglacial signal. We are on the down-slope of the glacial-interglacial cycle. On a side note… I recently unpacked an old box of textbooks and found my old geomorphology text book: Principles of Geomorphology by Don J. Easterbrook, McGraw-Hill, 1969. True, but an impact could have initiated such a period on an earth already in an unstable climatic situation. yes, the attractors per se would be compatible with both cyclical disturbances and random ones. However, rgbatduke was emphasizing random disturbances, and that is what I had in mind when I posed the question. Multistable in what sense? Is the more ice/less ice glacial/interglacial regime bistable? From the data above it doesn’t look very stable at all. What were the multiple attractors scattered all over phase space doing for the vast majority of the Zoic when the planet was ice free? OK, but the YD (in NA & other NH regions) is marked by a soot, iron dust, nanodiamond, etc layer where no more fossils of large mammals are found above. Didn’t happen on any of the other 28 swings. It is interesting to see all this discussion around the ice cores oxygen isotope ratio with time, but some oddities struck my eyes: first, how you can, seeing merely to the graphs, tell that the inter-allerod was a glacial period and that the next period ( the resuming of allerod) was a melting period. Looking the values (and maybe all values everywhere) it is impossible to assess by picking to a particular point of temperature (pardon, isotope ratio) plot to directly infer the general conditions of climate. Obviously, you have to look right and left of the selected point, to see if the values are around a certain mean, but also you have to look if you have glaciers melting or reconstructing in the same time. If I wanted to infer some superficial conclusion from the ratio graph, I could say that a much larger time interval should be considered as “second part of allerod” because values are pretty at the same level for a longer period than the “red part” in the graph 1 around 13ky before present. I suppose that cross evidence is saying otherwise, but the point there is that such series are not indicative alone of the inertia of the general climate. Another point, what is the assessed inertia of the ice sheets formations and melting? Do we have the same variability found in the O16/O18 graph? I suppose not. And then: what is the *current* trend of ice sheet melting/formation? Do we have *recent* ( that is related to the last century) measurements of O16/O18 ratios? How the two time series (ice sheet formation and ratio ) correlate? Do we have hints of trend of next century ice melting/formation? This is because, caused by human or not, if the sea level will rise one or two meters in one century, we still have to prepare for it. While some of the recent work on a YD impact is interesting, virtually all of the supposed impact evidence can and has been interpreted otherwise. YD lacks a clear PGM anomaly and no significant evidence of cratering. 1) Rapid extinction of many megafauna, particularly outside of Africa and parts of Asia. 2) The rapid expansion of humans into the areas in which the megafauna rapidly went extinct. 3) YD was the last Late Pleistocene glacial stadial. It’s certainly possible that an impact or bolide played a role in the extinctions, but it almost certainly didn’t trigger the YD glacial stadial. We know absolutely that “men” can cross the entire North American continent in less less than 2 years: less than 6 months across the mid-plains (St Louis for example) to California, Oregon, Washington. Lewis and Clark expedition from Washington DC all the way to the Pacific coast, wintering over on the Missouri River in the Dakota’s. The Spanish conquistadors from mid-Mexico to Colorado to Texas to the California Baja peninsula in only 2-3 years. So, assuming that “ancient men” needed hundreds or thousands of years to “inhabit” north America seems utterly wrong. Likewise, the effect of humans near the Dryas events WOULD BE different than any earlier climatic changes: If all around you, people in your tribe are starving and winter is longer and longer, would not the “new” affect on large mammals through fires and hunting and loss of prey be dramatically different? Today’s universities cannot afford to admit any adverse environmental effects due to the “noble savage” of pristine wilderness and “pure” non-capitalistic non-European (evil) non-Christian societies – they’re too politically-corrupt to be scientifically-correct. but, combining very rapid climate change from meteor impact (perhaps) combined with frequent hunting and killing of large land animals could explain several otherwise “coincidental” simultaneous phenomenon. We’re living on borrowed time. Greens love to worry about sustainability. Their version of this worry is based on the now-discredited Malthusian Horror. I also worry about sustainability but my version is a bit different: How will we sustain the gains when our current Holocene Eden comes to its inevitable end? I believe this to be a bit of a rhetorical question since it is probably not possible to sustain the gains. When the switch flips back to cold, billions will likely perish. I’m sorry, I don’t understand what you are trying to say. I was commenting on a Late European Paleolithic art producing culture that exihbited a developmental continuity of 6000 years precicly because they developed stratagies to accomadate dramatic climatic variations. The point being, that mankind is amazingly adaptable, and if a primitive culture can adapt to climatic variablity, with their limited technology, then modern man will have no proble. What point were you trying to make? Saw a researcher on a ScienceChannel program in a Ohio cave that contained the YD soot layer (no other distinct layers were visible). He scraped a magnet just above, then below the layer. Nothing. Then on the layer. He blew it off to remove anything not sticking, & it had collected a layer of metallic-gray dust — iron dust. Not a geologist, but pure iron dust is hard to come by except from an extraterrestrial impact, I would think. Don’t agree you can be sure of that. The climate situation at that point, from the ice-cores, was already unstable & a significant impact (especially in the sensitive NH region) could have triggered a much longer-lasting & even global climate-shift. The YD laid down a meter-thick layer of fine, wind-blown dust in the Chesapeake Bay area (directly above the soot layer) that no other event caused for hundreds of thousands of previous yrs. There’s something different & unique about the YD. And ….. they managed to do it without GPS or Google Maps. Black mats are common features in paleowetland deposits and typically represent shallow marsh environments. In this study, we investigated black mats ranging in age from approximately 6 to more than 40 ka in the southwestern United States and the Atacama Desert of northern Chile. At 10 of 13 sites, we found elevated concentrations of iridium in bulk and magnetic sediments, magnetic spherules, and/or titanomagnetite grains within or at the base of black mats, regardless of their age or location, suggesting that elevated concentrations of these markers arise from processes common to wetland systems, and not a catastrophic extraterrestrial impact event. 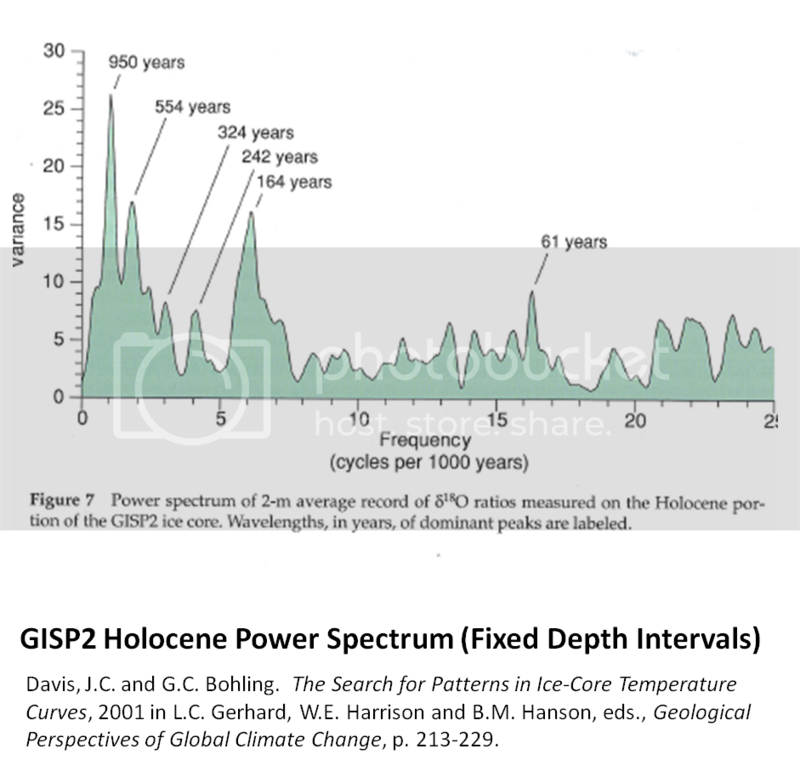 The DO events occurred like clockwork during the Late Pleistocene with a frequency of 1,500 years (+/- 10%). Few climatic features can be documented as having such regularity. While a bolide certainly could have played a role in the extinctions (some recent work is rather compelling), it is highly unlikely that it coincidentally caused a glacial stadial to occur on the exact same schedule as it had been occurring throughout the most recent Quaternary glacial stage. I guess the TV, the researcher, and I were just making it up? Jeesh. And it is in the literature — iridium, unoxidized iron, magnetic spherules & nanodiamonds have been documented in some (but not all) of the layer sites. Yeah, I’m well aware of the DO events. And the fact that the climate was teetering on a DO event doesn’t preclude an impact (or any unusual disturbance like a meltwater pulse) from precipitating one — it might trigger it. Thanks for the answer and clarification Don! Actually abrupt change is not just generational but can happen within a decade. Dr Easterbrook is addressing changes in the 100 year time scale but Dr. Richard Alley, and his colleagues found that the last ice age came to an abrupt end over a period of only three years. link and found local warmings as large as 16°C, occurred repeatedly during the slide into and climb out of the last ice age. “…Recent scientific evidence shows that major and widespread climate changes have occurred with startling speed. For example, roughly half the north Atlantic warming since the last ice age was achieved in only a decade, and it was accompanied by significant climatic changes across most of the globe. Similar events, including local warmings as large as 16°C, occurred repeatedly during the slide into and climb out of the last ice age…. climate models typically underestimate the size, speed, and extent of those changes. Hence, future abrupt changes cannot be predicted with confidence, and climate surprises are to be expected. ….Fossil evidence clearly demonstrates that Earth vs climate can shift gears within a decade, establishing new and different patterns that can persist for decades to centuries…. This new paradigm of abrupt climate change has been well established over the last decade by research of ocean, earth and atmosphere scientists at many institutions worldwide. But the concept remains little known and scarcely appreciated in the wider community of scientists, economists, policy makers, and world political and business leaders. Thus, world leaders may be planning for climate scenarios of global warming that are opposite to what might actually occur…. Trying to dodge “attractors scattered all over the place” is a mug’s game. It leads to total fearful inaction. The only rational course is to treat the odds of favourable and unfavourable consequences as equivalent and try to maximize resilience in capacity to respond to either. I’m afraid that your megafauna extinction assertion may only be true for parts of North America. For a contrast, In Europe the megafauna died out roughly 13ka 14C BP (~16ka cal BP), whilst co-existing with humans for tens of thousands of years. In Siberia mega fauna thrived thoughout the Younger Dryas in some refugia, especially the Taimyr peninsula, until some hundred years into the Holocene, without a shred of evidence of humans witnessing the event. Some species like the giant elk died out well in the Holocene and there are also some “suspect” young carbon dates of American mastodos to well into the Holocene. Personally, I think the primary driver of the megafauna extinctions was the relatively rapid movement of humans into North America and Northern Europe & Asia during the late Pleistocene and early Holocene. Each and every deglaciation would have been massively disruptive to megafauna habitats. The glacial stadial/interstadial transitions would have also featured quite a lot of glacial outwash-induced habitat disruptions. Throw in the arrival of skilled human hunters and their hunting dogs during the Oldest Dryas and that habitat disruption eventually became terminal for most of the megafauna. There’s ~30,000 feet of Pleistocene sediment in some parts of the Gulf of Mexico deepwater. That sediment largely got there as a result of glacial outwash.